Sift flour, baking powder, salt and cocoa powder together through a fine sieve thrice and keep aside. Beat sugar, eggs, and vanilla essence and butter together, very well till light and fluffy. Add sifted ingredients a little at a time, beating in at slow speed. If the mixture will not beat because its too thick, beat in cold milk, a table spoon at a time. 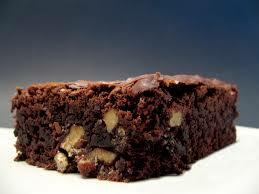 Pour into a greased, floured, brownie pan in a medium oven (350 deg), for 25/30 minutes or till a clean knife inserted into the brownies comes out without the mixture attached. Cut into squares while warm. Allow the brownies to cool. Note: If you want to keep the brownies moist, keep them in an airtight tin box.